(From left) Lee Han-byul and Cha Chang-bae, still in their 20s, are driven by entrepreneurial passion. Last August, Lee Han-byul and Cha Chang-bae became the first graduates of KAIST’s Master of Entrepreneurship and Innovation Program. Three months have passed since then. Have they succeeded as entrepreneurs? With a clear vision for the next ten years, they are racing ahead at full speed. 85, Wolpyeongbuk-ro, Seo-gu, Daejeon. This is where their key to entrepreneurial success lies. Recently, they opened a private academy that teaches coding to young children. Their goal is to nurture talent in programming and to generate profit at the same time. They began dreaming of becoming successful entrepreneurs after joining the Master of Entrepreneurship and Innovation Program at KAIST. The two had led completely different lives, but shared an entrepreneurial passion. Lee did not have a clear purpose in life before joining the army, but started planning ahead during his enlistment. He believed that "happiness comes from doing what you enjoy.“ Upon completing his military service, he decided to attend classes on entrepreneurship. 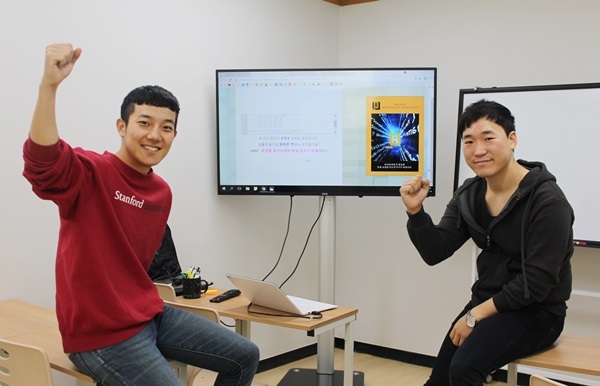 Just when he felt discouraged from his lack of knowledge and personal connections, he learned that KAIST was recruiting new students for the Master of Entrepreneurship and Innovation. The two graduates say that the greatest advantage of the program is its provision of systematic training on practical matters, enabling potential entrepreneurs to be better prepared before launching their own companies. This comes as no surprise, since the Master of Entrepreneurship and Innovation program was established for this very purpose. In order to obtain the master‘s degree, students have to earn 12 credits in major courses, 3 credits in Entrepreneurial Leadership or other common mandatory courses, 4 credits in Advanced Capstone Design, 8 credits in elective courses offered by the K-School, and 6 research credits in the Startup Onsite Practicum, for a total of 33 credits. "Happiness From Teaching... A Wish to Nurture Talent in Programming"
The duo quickened their pace once they decided to focus on programming education. Lee invested the funds he had saved since his undergraduate days in acquiring the educational space. The sign on the entrance emphasizes that the academy, which specializes in coding classes for young students, is run by KAIST graduates. Lee, with a major in computer science, teaches the classes himself. The private academy opened only recently, but it is already seeing a huge increase in the number of students.